Another pair of amazing errors emerged from an old collector's vault. This time it came from the modern coins produced by the Bangko Sentral ng Pilipinas. 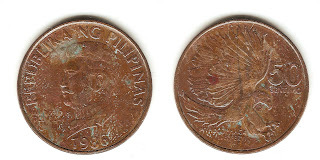 In 1983, the Bangko Sentral ng Pilipinas (BSP) produced a series of coins which is called the "flora and fauna" where it featured the indigenous plants and animals of the Philippines. One of the most familiar animal used on these designs was that of the eagle, where it made a second appearance in a Philippine coin only then, the eagle being featured was the Philippine Eagle (Pithecophaga Jefferyi) instead of the previously used American Bald Eagle during the period of American occupation. This denomination become an interesting piece for collectors of Philippine coins since errors began appearing soon after the series were issued to the public. Misspelled names were the caused why the BSP had to re-issue two of the denominations involved, the ten centavos and the fifty centavos coins. The Latin name of the Philippine Eagle was spelled as "Pithecobhaga Jefferyi" instead of "Pithecophaga Jefferyi". Another remarkable event that happened in Philippine history that was Edsa Revolution, otherwise affected the designs and manufacturing of Philippine coins and that particularly showed the changes between the issue of 1983-85 Fifty Centavos coins and the 1986-92 Fifty Centavos coins . In 1986 after a new government was installed, the design of the eagle was altered making it appeared bigger. A trial strike this denomination in copper could be compared to a regular issue to observe the changes that occurred.